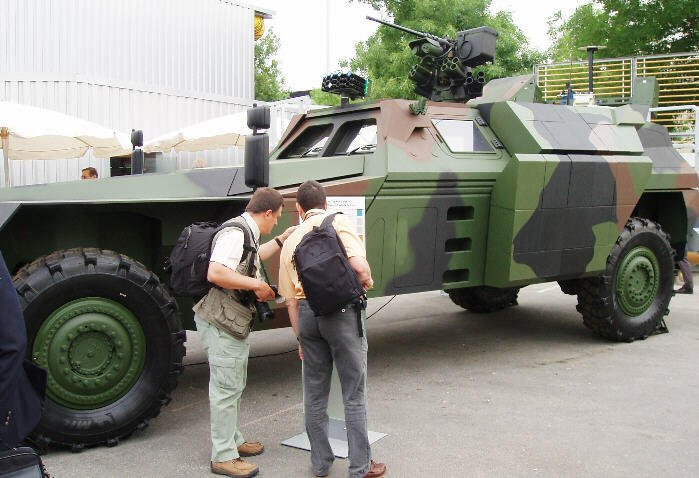 The Eurosatory exhibition was held in the Parc des Expositions, about 20 minutes RER (local train) travel north of the Gare du Nord, and one stop short of Charles de Gaulle airport. It ran all week, from 12th-16th June, although your reporter only managed a couple of days (walking for miles while lugging my working copy of Jane's Ammunition Handbook plus a growing load of brochures gradually wore me down!). The focus was very much on land systems, with relatively little on naval or air force equipment with the principal exception of guided missiles. About half the exhibition was out of doors, so there were lots of big vehicles present (including some huge bridgelayers). 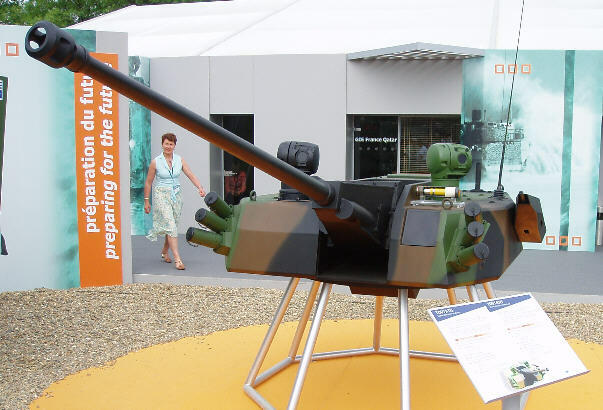 As usual at such exhibitions, even the most obscure aspects of military equipment were included in the stands, not just the obvious front-line stuff, so what follows in my report is a highly selective take on the bits which interested me most. I'll focus on particular themes and trends which struck me as I wandered around. 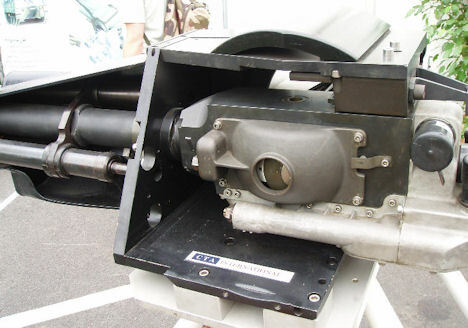 The US plans to introduce 25mm grenade rounds in high-tech weapons featuring airburst rounds (XM307, XM25) has stimulated the development of similar airburst technology from makers of the current 40mm weaponry. 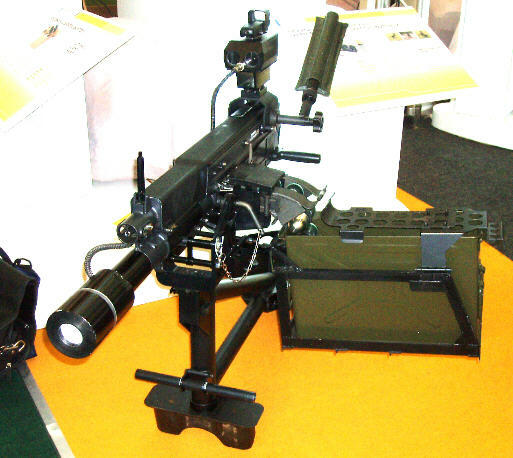 These developments not only affect the automatic grenade launchers firing the high-velocity 40x53SR rounds like the Singapore Technologies Kinetics Light Weight AGL shown below, but now the low-velocity 40x46SR rounds for firing from under-barrel grenade launchers. IMI were showing a very neat piece of kit on their Tavor rifle, the MPRS (Multi-Purpose Rifle System) whose core is the Orion sight+laser rangerfinder+fire control system, all in a small unit which clips onto the standard rail and is used for aiming the rifle as well as the grenade. I didn't get a pic, but the rather low-quality one shown below is scanned form their brochure and shows the sight on an M16. 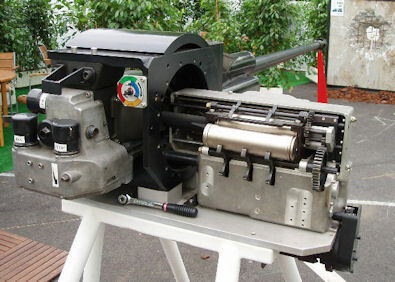 This is used in conjunction with a new airburst low-velocity round fired from a modified under-barrel launcher, with a time fuze electronically set on firing. 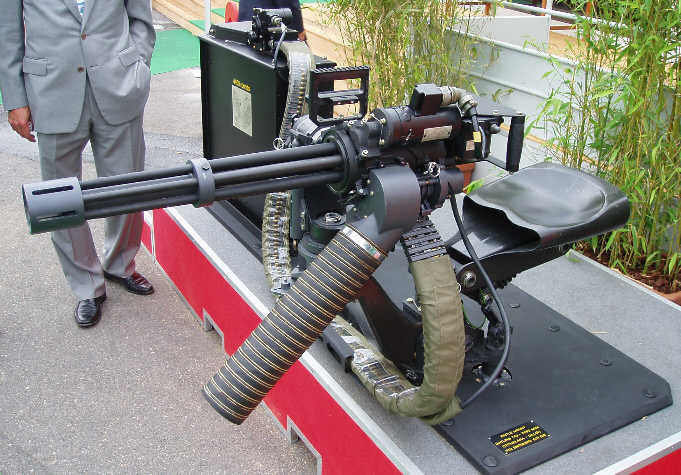 It has an effective range of 300m with an accuracy of 1m at 250m. 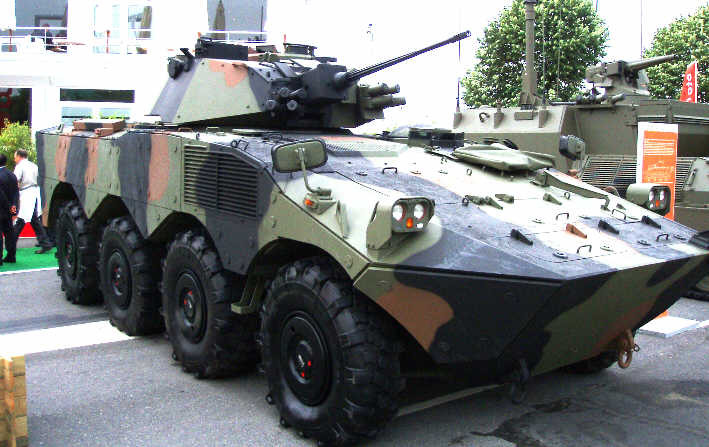 It is expected to enter service with the Israeli Army in June 2007. You do wonder if the US is getting overtaken by simpler solutions in their efforts to produce the XM25, whose main advantage is a multiple-shot facility. IMI were also showing Reconnaissance Rifle Grenade with a video camera as another element of the MPRS. 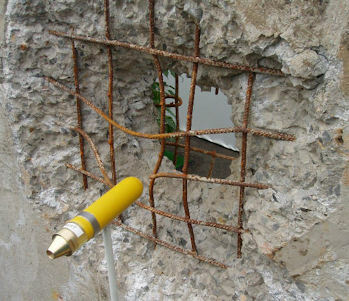 This is a bullet-trap type, fired using standard ball ammo, and transmits its images directly to the firer's PDA. 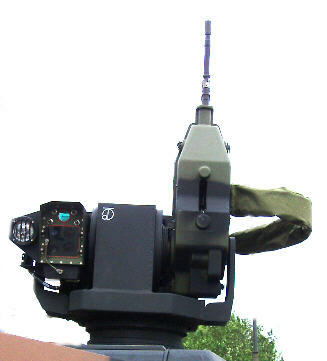 It has a maximum range of 300m, and transmits pictures between 150-300m - obviously useful for looking behind cover and identifying targets for the airburst 40mm grenade. and the the Redback, which appears to be the most developed. 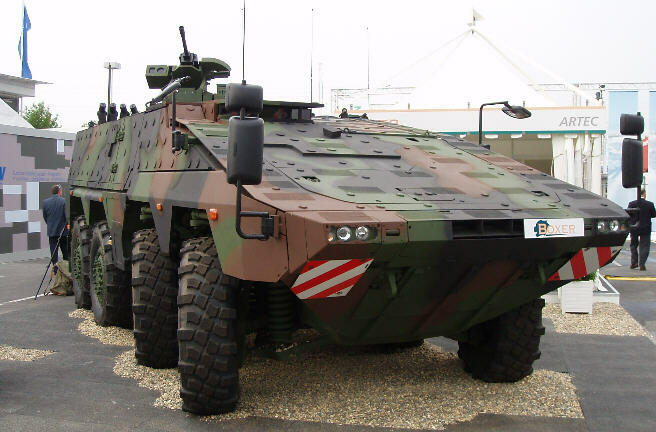 This has the barrels in a diamond pattern, and is a remote control device intended for fitting to the roof of any vehicle (it weighs 70 kg, complete with imaging sensor, thermal sensor and laser rangefinder). And - you've guessed it - they're promising airburst technology. 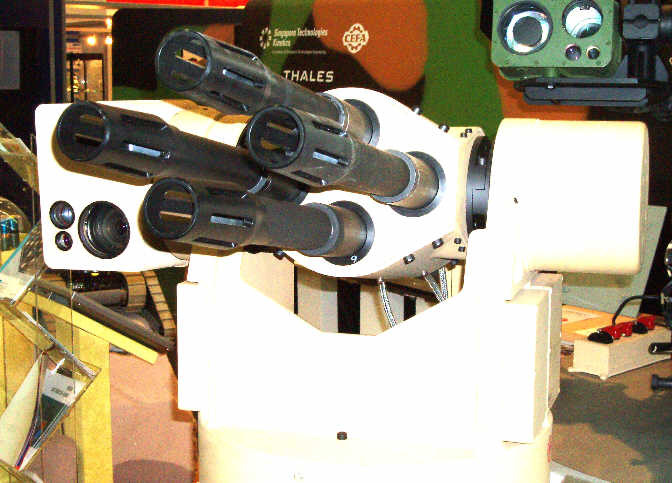 The next ammo trend I spotted is the growth in the number of guided 120mm mortar rounds being developed. 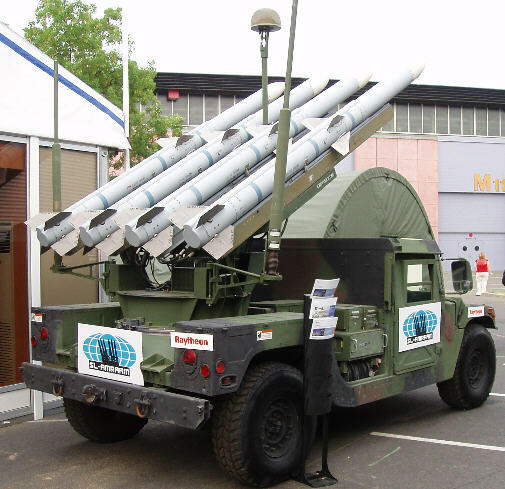 Two of them, no less, from Israel: an IMI round in the final development stage (ready in 2007) with a range of up to 10,500m, and the IAI Fireball, which has snap-out front fins so it can glide further. 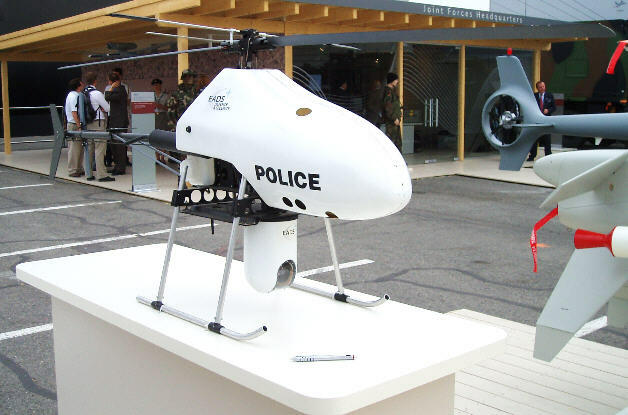 Both of these use a combination of GPS and laser-homing guidance. The GPS can be used to place the round in the right zone to pick up the laser reflections, or by itself. IMI are using Differential GPS with a 2-3m CEP (1-2m with laser homing). 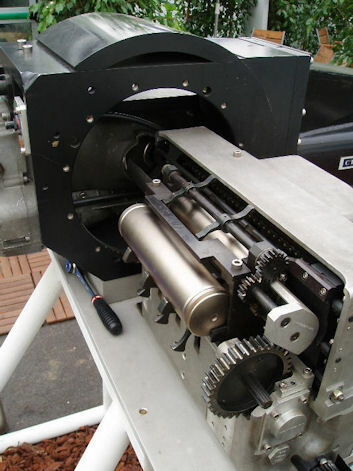 The laser homing can also be used by itself, in case of GPS jamming. 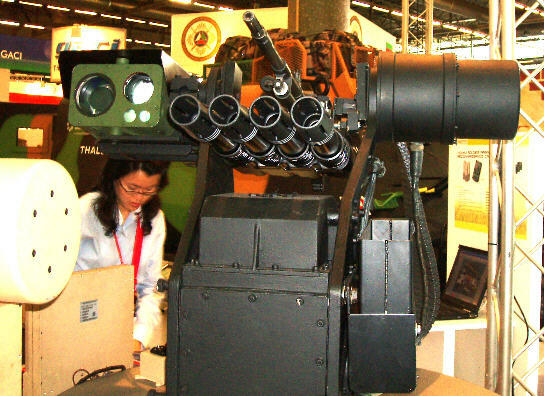 The US is also developing a laser-guided round, but to an apparently more leisurely timescale. 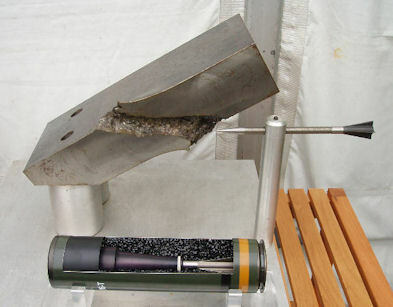 120mm Cargo mortar rounds are also proliferating, such as the IMI M970 which carries 20 M87 submunitions (each of which can penetrate 105mm armour and produce 1,200 lethal fragments). 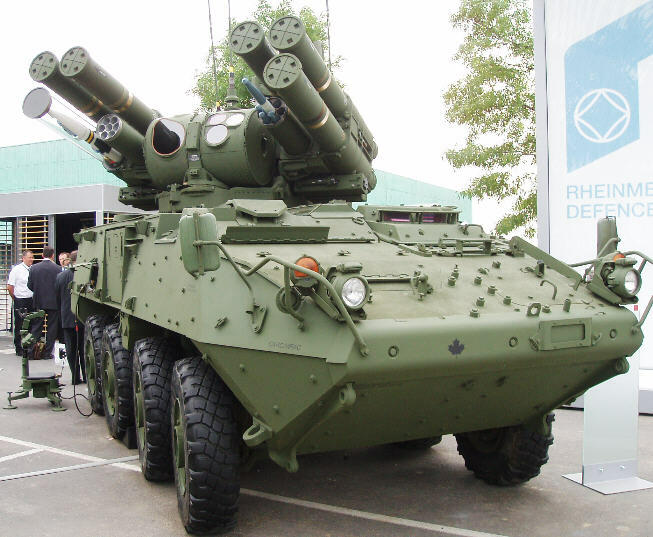 This can reach up to 9,000m from long-barreled mortars and scatters its submunitions at a height of 450-500m. 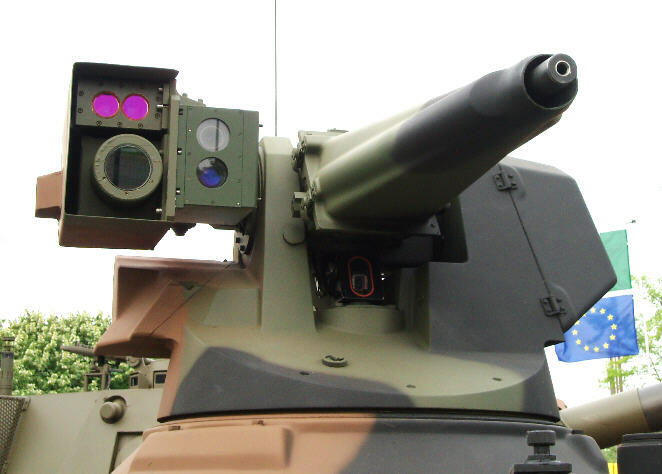 These are now spreading like wildfire, particularly in smaller calibres (up to 12.7mm MG or 40mm AGL), to the extent that actually having to get behind the gun and aim it by eye is now looking so 20th Century. A few are shown below. 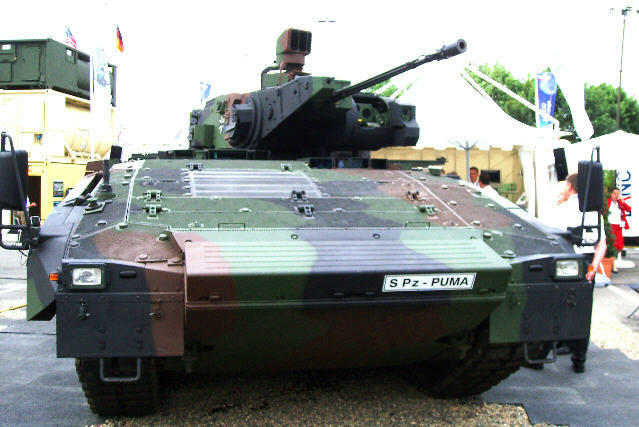 The key to the success of these mountings is of course the constant improvement of optronics, not only for sighting the gun but also for providing situational awareness for the commander by providing a wide field of view - and, via thermal imaging, doing so at night and in poor visibility. The prevalence of relatively close-range urban combat is also making it riskier for the commander or gunner to pop his head above the armour to see what's going on. For the more traditionally-minded (or poverty-stricken) a few mountings for manual aiming were shown, but these tend to be wrapped in so much armour that situational awareness must be a bit restricted anyway - as with this 12.7mm one on an ACMAT VLRA. I've been keeping an eye on this one for some years, and it seems to be coming along nicely. 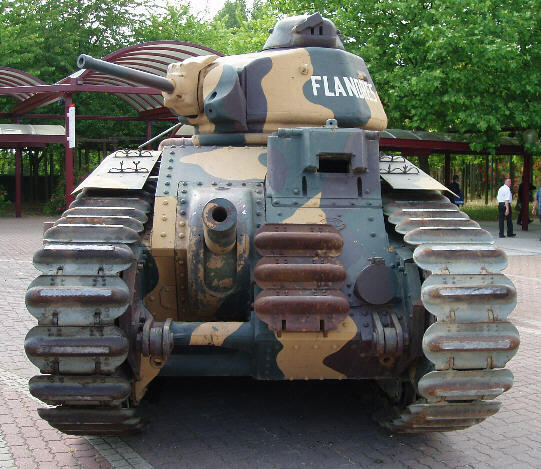 The British version (in a two-man turret) is more advanced, with a returreted Warrior scheduled for user evaluation in November 2006. 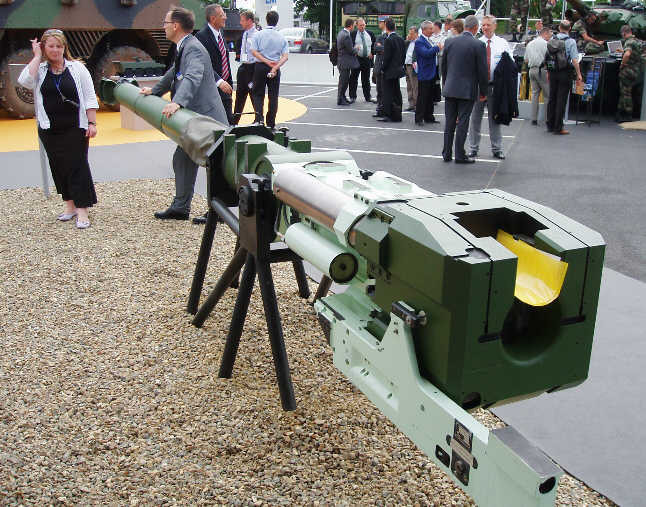 Selection of this weapon for the programme to improve the Warrior isn't a done deal as under British competition rules there has to be a contest, so bids to supply a new gun "of 35mm or greater calibre" are being invited. My money's on the CTWS though. 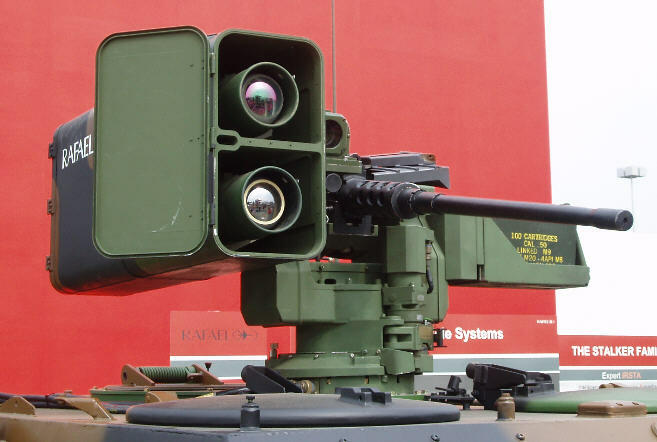 The French are developing a more compact unmanned turret (shown below) weighing only 1.5 tonnes rather than 4) but are still at the technology demonstrator stage whereas the British turret seems to be ready to go, having already been tested thoroughly. 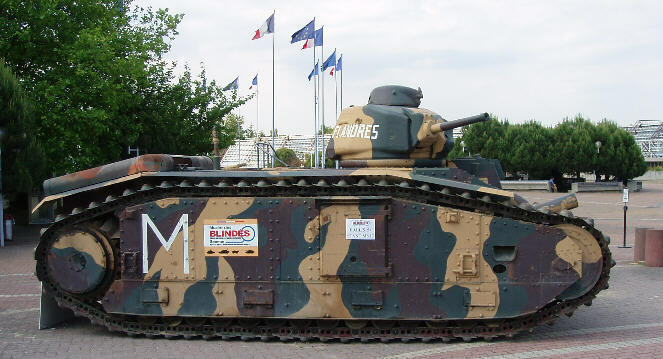 The French will also be trying their turret on a Warrior, for comparison purposes, with user evaluations in January 2007. 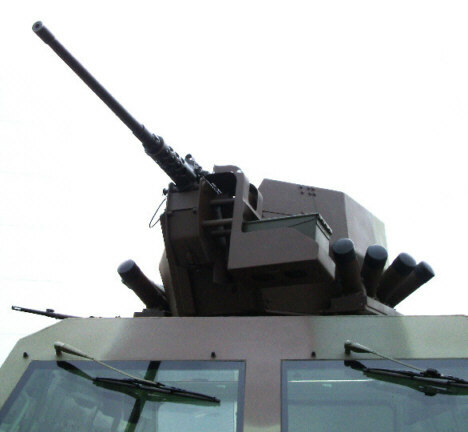 Both turrets feature stabilised guns and sights. 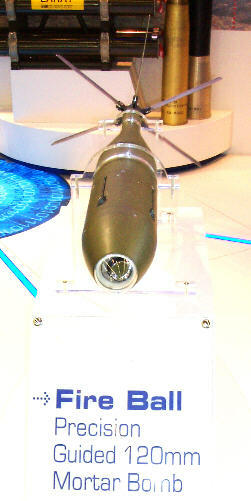 The ammo was also on display, together with examples of its effectiveness. The standard HE round (known as the GPR-T, for General Purpose Round Tracer) is available in two flavours, Point-Detonating and Airburst. 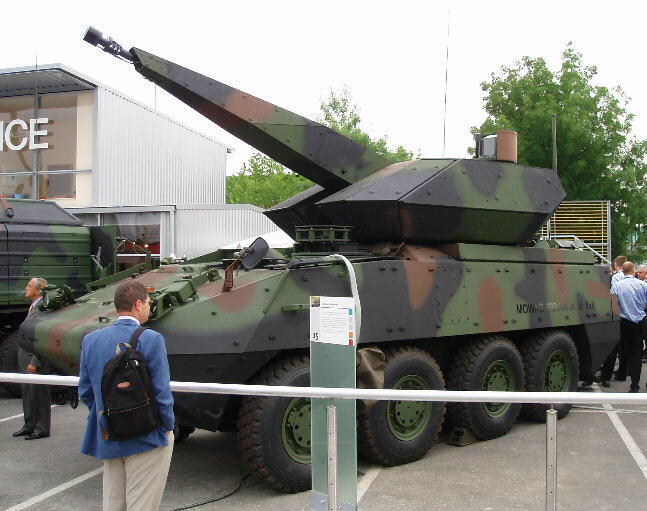 The APFSDS-T can penetrate more than 140mm of RHA at 1,500m. The dart weighs 550g and is 215mm long. The block of steel shown in the pic below is 75mm thick. 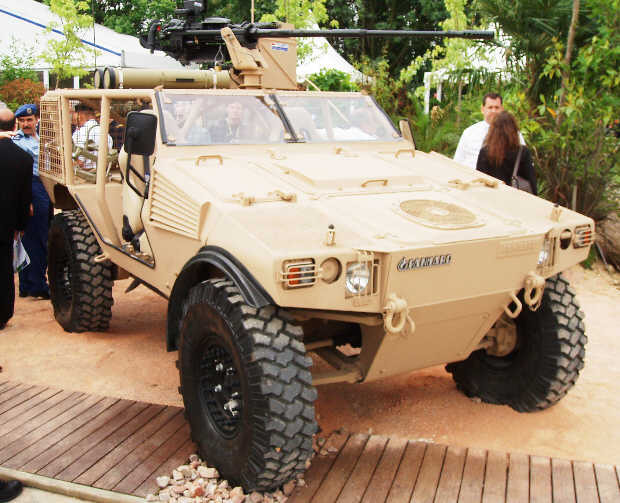 The GEFAS mine-resistant vehicle. The front wheels are way out in front to minimise the effect of mine blasts on the occupants. 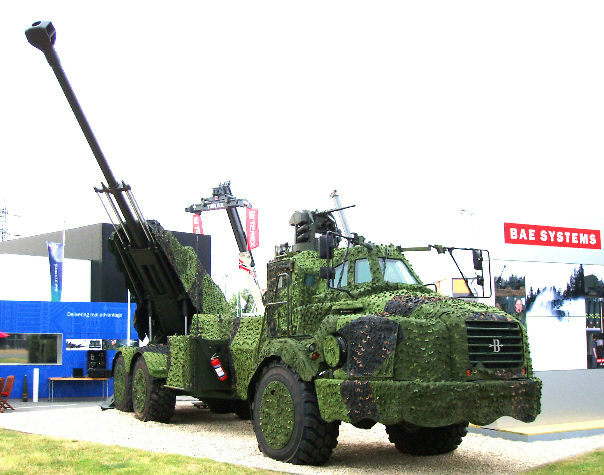 The ginormous new BAe/Bofors 155mm wheeled SPG, complete with autoloader. 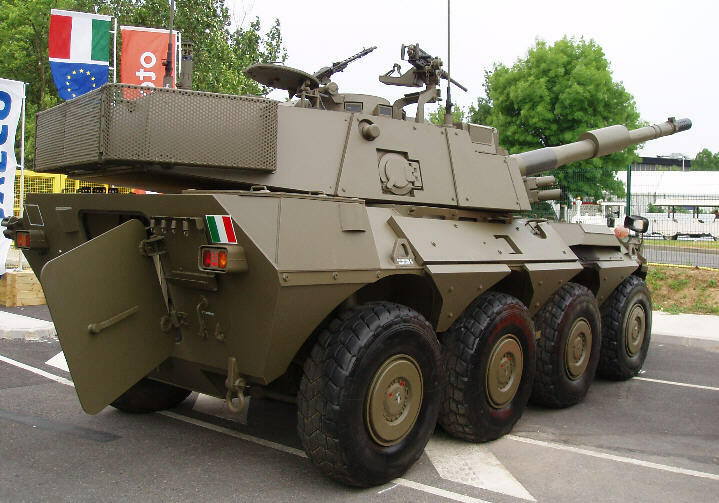 Both 155mm and 105mm artillery pieces on lightly-protected trucks are very popular for expeditionary purposes these days, as they are more easily air-transportable and can also travel a long way under their own steam.